When it comes to strategy there are many illusions. We would like to think strategy is intentionally formulated (and then implemented) by top management. We imagine an off-site of the management team where strategy is dreamed up and designed. There are major decisions which are then carefully cascaded (down) through the organisation ultimately resulting in a sustainable competitive advantage. Many years ago Henry Mintzberg did something both simple and amazing… he became a “fly-on-the-wall” researcher following managers around, observing what they actually did when managing and when strategising. The result was quite demystifying. It turned out managers were not half as intentional as what management books had been telling us and what we thought they would be. It was a big surprise because even managers themselves – when we had asked – told us they were intentional planners. So Mintzberg put this intentionality management illusion to bed and we now know there is sometimes intentional strategy but there is also very often emergent strategy originating from autonomous strategic behaviour within the company. Emergent, autonomous strategic behaviour… it is quite scary to many a command-control manager. However, it turns out that it is actually very important and beneficial to the performance of a company. It starts as informal projects which can be somewhat dissonant to the current overall direction of the company but are inspired by a rationality of the “local” sort. Laurent Mirabeau and Steve Maguire illustrate this in a very interesting empirical paper recently. Through time as these projects gain support (or not: ephemeral strategic behaviour) and this support happens through the introduction of new strategic categories or – more often – by stretching existing strategic categories (post-rationalising). In many ways it is like patterns of the past become plans for the future (see Mintzberg). 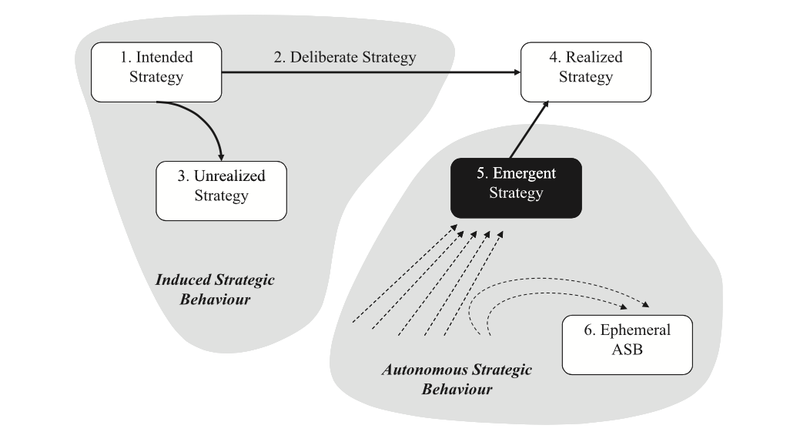 Conclusion: Improving strategy is (also) facilitating autonomous strategic behaviour in your organisation. Next Next post: Would reminding an apple it is part of a bad barrel make it bad?